When Asian Deli skedaddled to Diamond Bar a few years ago, it left Orange County deprived of its only Indonesian restaurant. The nearest alternative for hungry expats existed just beyond the Orange County line, at Toko Rame in Bellflower. Meanwhile, in O.C., Indonesian food remained the Rodney Dangerfield of Asian cuisine. It gets no respect. So when a reader* tipped me off to a new Indonesian restaurant inside the Orange Curtain, my exact words were: "HOLY SH*T!!!!" The news couldn't have come at a better time. A week ago, I'd learned that Pondok Kaki Lima -- the every-Saturday outdoor gathering of Indonesian vendors at the Duarte Inn -- was recently shut down by the state**. As fortuitous as it is bitter sweet, and in a "one door closes, another one opens" kind of way, I found myself in a parking lot at the corner of Harbor and Garden Grove Blvd. There, next to Chuck E. Cheese's and a 99-Cent-Only store, in the shell of what was a Chinese take-out, stood Warung Pojok, the newest and so far, the only Indonesian restaurant in Orange County. The name itself made me giddy. "Warung" is a general Indonesian term for casual eatery. In Java, it can constitute anything from a lowly shack made out of discarded aluminum siding or a brick-and-mortar structure. "Pojok" meant corner, but together the words actually suggested something else; hole-in-the-wall. There is no menu. No waitresses. Everything is served on Styrofoam. It is, in fact, fast food. Moreover, Warung Pojok makes full use of the chafing trays left behind by the Chinese take-out that was there before it. But instead of troughs of kung pao chicken and broccoli beef, now there's ayam goreng (fried chicken) and beef rendang (beef, stewed in spices). Instead of fried rice, it's nasi goreng (Indonesian fried rice) and nasi kuning (turmeric rice). Other than just dropping by and having a look, you can check up on what's being cooked that day on their constantly updated website. Also, on a white board, a few made-to-order items are scribbled. 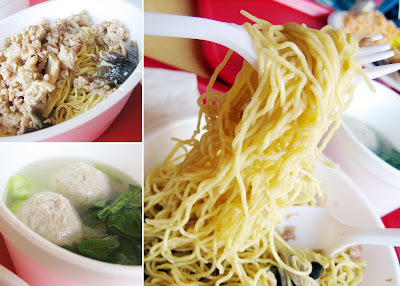 On my visit, it's mie ayam -- a classic Chinese/Indonesian bowl of egg noodles, coated in flavorful oil, topped with diced chicken and mushroom, served with a side of bakso (beef meat balls) in broth. You eat it as separate entities, first slurping the noodles, then sipping the soup immediately afterwards as a chaser. And in between, you slather everything with sambal (chili paste). The chafing dish selection is served as combos with rice or noodles. I tried sayur urap, a salad of boiled cabbage and kale dressed with chili-spiked grated shavings of coconut. And there was was a coconut milk-based curry of tofu and egg, which made my burps fragrant for the rest of the day. Rendang was seasoned confidently, with more spices I'd care to name here. It could've been softer -- though I am biased and still partial to my mom's fork-tender version. But make no mistake: even though Warung Pojok may appear to be no different than a Panda Express clone (they even offer boba milk tea), the food is authentic. Even the smell of the restaurant is distinctly Indonesian. How so? Well that's easy: it smells like how an Indonesian restaurant should smell -- like my auntie's kitchen back in Java. *Special Thanks to Monster Munching reader Tony for this tip. **Update (February 2009): Pondok Kaki Lima IS BACK ON! Fantastic! I miss the food of my homeland and it can be so labor intensive to make ourselves. I just told my parents about it because they go to the Westminster/Garden Grove area almost weekly. Great post Elmo! Sometimes some of the best food is delivered on styrofoam.....bad for the environment...but good for our stomach! How's their mie ayam? Is it anything like bakmi yanti? Hope they like it. I can't pinpoint what region or city Warung Pojok's cooks are from, since my Indonesian is too rusty to carry a conversation, but the food is good. If your parents try it, let me know what they think. You're right about that! I'd take great, cheap food on Styrofoam over good, expensive food on fine china any day. It's definitely an exotic cuisine, compared to Thai and Vietnamese (which are now very familiar to all of us), but if you've had Malaysian or Singaporean, it's actually slightly milder and sweeter. Ahh! Great question! I was hoping someone would ask that! The truth is, Mie Janty sets the bar pretty high. They make their own noodles and they pride themselves on it. I love Mie Janty. Warung Pojok's mie ayam, while great, just can't compete. But hey! Mie Janty is 50 some miles away. Warung Pojok: a heck of a lot closer! At least to me. Hey! I've had Indonesian food, and I didn't even know it! For our first anniversary, Dave and I went to this Indonesian/Malaysian restaurant in Chicago's Chinatown, and I had beef rendang. I remember liking it a lot. Thanks, by the way, for the anniversary wishes yesterday. I wrote about our dinner at the Gandy Dancer in my blog, and included pictures, too. The food there is amazing! I forgot to ask, what were their prices like? It seems like a lot of indonesian restaurants are a bit pricey compared to other asian cuisines. I recently went to Simpang Asia in LA and I thought the portions were quite small for the price. And of course, they only accept cash. Great find for a local indo place. My wife (indo) is always cooking up such great dishes, but sometimes we want to go out and eat indo food. We will be trying this place soon. So far the best places for indo food (IMO) is at the hong kong plaza in West Covina. Long drive but not too bad. The simpang Asia place there is MUCH better than the one in LA off the 10 freeway. Did anyone else go up to the Indo day celebration at the Indo Consolute in LA over the weekend. THey have lots of great music and about 6 food stalls of ok to good food. Excellent! Now all we need is a proper Cambodian restaurant and we have a decent presence of non-Vietnamese South East Asian Food! Will be sure to try Warung Pojok this week. Keep in mind: This is fast food. Not at all a Saturday night date kind of restaurant. But thanks for the update on West Covina. Had no idea Simpang Asia's there. Although I do usually make a beeline to Mie Janty when I visit. In my opinion though, nothing beats Pondok Kaki Lima. Let's hope they are allowed to sell again soon. Not to mention Burmese food. That's one cuisine that also non-existent in O.C. Thanks for the post/review about Warung Pojok, Elmomonster! We really appreciate your opinions. We are still new and will improve as we go along. 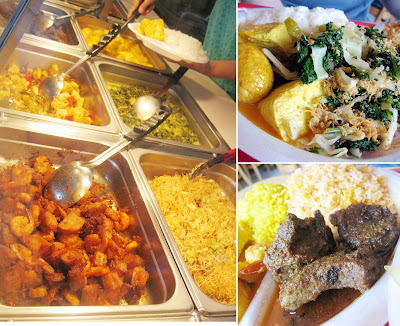 Please don't hesitate to send comments or concerns to our email (can be found in our website www.warungpojokindo.com). There will be some coupons as well in the website. Hopefully will see all of you (readers) at Warung Pojok Garden Grove soon! Hi. The soup up there looks a lot like matzo ball soup, though I assume it isn't. What is it? Good luck with your new restaurant! I do have one suggestion though. Perhaps you can put prices on your website? It does look like matzo! But it is actually beef meatballs. It's not meatballs as Italians do it, or even the Swedish -- it's a mix of starch (I think either corn or tapioca) blended together with ground meat into a paste and then formed into spheres. It's delicious! Elmo, I will put the prices on the website. And for Diamond Dog, I will do the translations/descriptions in English for the dishes. You sure get around!!! Got your site via an email (again) and I keep discovering new places in So Cal to go to when I come and visit from Utah. My question is........ have you been to the Holland Festival in Long Beach yet??? Some one wrote about it on your Kaki Lima blog but I didn't see where you actually had a chance to go. Most all of the stands in the Kaki Lima (or Pasar Makan as it is referred to by the "weekly" goers) have a tent there also. But...... you must wait until May again as the Festival is ALWAYS held on Memorial Day Sunday. Hope you get to go next year, a trip well worth it with lots of Indo Rock music by a popular local band, and ofcourse Dutch Music and entertainment. Hope to see something on your blog about this. Cool abit down the street from me but I should swing by when I get a chance......Yummmm BURP! Translations! Of course! Funny, because since I can read a little Indonesian, it didn't even occur to me until your comment that most folks wouldn't be able to understand their menu! Thanks! Hehehe! I do get around. You might say I'm a promiscuous eater (now there's a name for a food blog!). And I'm marking my calendar for that LB Holland Festival on Memorial Day! I completely missed it this year obviously, since I didn't know when it was. Thanks! If they still have soto betawi when you visit, that will render the tastiest burps! I haven't tried theirs, but soto is one of my faves. My Vietnamese coworker told me about this new Indonesian restaurant this morning and I was like "Holy Crap" , are u serious? I live only three blocks from that place. As a matter of fact, I used to go there a lot when that place was a Vietnamese Restaurant. I then stopped going there when they sell Chinese food. Anyways, my wife and I went there tonight and we thought the food was great and the price was reasonable. I had 'gulai kikil and sayur nangka and tahu/udang' and my american wife had mie ayam jamur plus krupuk and es campur. They were yummy. Since both of us eat out everyday, cause we dont know how to cook, warung pojok will be our regular eating place. I like that you had the same reaction when you heard...I think that there must be at least dozens more Indonesians in O.C. who might be just as stoked as we were to hear. Let's just hope other enterprising cooks recognize the demand and heed the call: We need more Indonesian restaurants here! also post the hours of operation on the website would be helpful. HAHA! You're an out of the box thinker you are! The first thing people will notice is how friendly the family that owns it is and how they interact with you. I have not had a lot of Indo food, so I primarily went for that reason. Since its so far, I don't know if I would ever crave that kind of food and make a special trip for it. 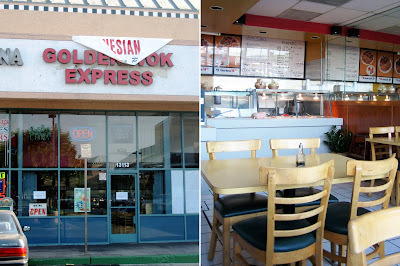 There used to be an Indo place on Katella close to the Home Depot. Their Nasi Goreng was INSANE. I did used to go there and just get that. I did it for a couple of years, then they closed down. Do you remember this place? As far as this place, I didnt really care for the kale in coconut milk. The beef feet were really good. I doubt you could tell the difference between that and tripe. The potato/shrimp thing was OK. Shrimp were dry and they did not remove the shimp poo poo vein. I thought the Nasi Goreng was kinda uninspired. Their rice noodle thing (we call it Bi Hun) was just OK too. I prefer the drier style. The fried chiken was really really good with the jalepeno Sambal, but without it, it doesnt really stand on its own. The fried tofo was excellent, especially with the the jeleno sauce. Their sambal sauces were realy really good. The noodle thing with the seperate soup was also very tasty, but I don't feel was that unique. So those are my thoughts on this place. Someone needs to make that whole pig thing basted in coconut milk that you posted about today. I don't know why people just don't exactly duplicate things that they know are awesome. I bet most Indo people know about that dish, yet its virtually never available here. Cool, I'll tell my mom about this place. My parents are Dutch-Indo and while Mom does some home cooking, she doesn't cook the fancy stuff that often. When they get a craving (usually for a birthday party) they get it catered from the owners of now-closed Susie's Kitchen who live in Cypress. Always a thorough and honest review. Thanks DD. Now that you've gotten a taste of Indo food, I'm pleased to pass on the news that it looks like Pondok Kaki Lima will be back in business this Saturday (9/13/08). I'll confirm when I get word. But hey, DD, even if you can't get to it, and you ever find yourself in an another Indonesian restaurant someday, try "soto". I think that is probably the most unique and representative dish from Indo. You won't find it in most other SE Asian cultures. And you're right, some enterprising Indo cook must open a babi guling restaurant. If they're afraid they won't get any business since there are few Indonesians, the Filipinos will be all over it and think it's lechon! I heard that the Susie's Deli folks still cater. Somebody should try to convince them to open up a restaurant in their home town. I'll be the first in line. Been here and done that. Not impressed at all. food was average at best. Great idea just poorly executed. Thanks "anonymous" for the review and sorry you weren't that impressed from your last visit but we're still cooking and people still enjoy the food... We hope your next visit will be a better one. Who knows maybe you'll get to eat something different. Check out out website www.warungpojokindo.com for Today's Menu. Love the food. Been here more than 3 times, the noodles was the BOMB!! Love the services. Friendly, in fact friendliest service I've ever received. We LOVE this place, and will be going to dine in as well as to-go. Visited Warung Pojok this past Saturday and it's a WINNER! The Mie Ayam Bakso tasted just like the ones I used to snarf down in Jakarta. And their sate ayam is just fantastic- I miss having the tukang stop by the house and ordering sate. Bringing in the food and opening up the newspaper & banana cover... just magic! Any updates on the Duarte Inn's Pondok Kaki Lima? YES! PONDOK KAKI LIMA IS BACK! SPREAD THE WORD!